Hey, friends! I’m slowly recovering from our week and weekend of celebrations and decided to give myself Monday off from blogging. We have been able to go on so many fun Chicago adventures lately, and I am so excited to share them with y’all. Today, I wanted to share my latest PopSugar box. The items were more useful than fun this time, but I still thought it was a good haul. Henri Bendel Signature Stripe Canvas Dopp Kit ($28): I have a bunch of makeup travel bags, but this one is so cute! I’m a sucker for anything with stripes. Sorial Card Case ($28): I have never used a card case before, but I think this one is cute. It would work well with the Sorial wallet on a chain I received in November. Supergoop! Defense Refresh Setting Mist SPF 50 ($28): I love the Urban Decay Setting Spray, so I am excited to see how this one compares. I’m not in love with the rosemary scent, but I love that it’s SPF 50. POP Silver Portable Sonic Toothbrush ($20): I love that this electric toothbrush is the perfect size for traveling! Yes to Blueberries Cleansing Facial Towelettes ($5.99): Extra cleansing wipes never hurt! I love using cleansing wipes to remove my makeup. Hallmark Signature Cards: I received three beautiful cards from Hallmark. They are seriously so gorgeous, and I can’t wait to use them. The Good Bean Fruit and No Nut Bar ($1.99): I love getting bars in my PopSugar boxes because they are great snacks for Chris at the hospital. I came up with a total of $126.94 for this box. I liked that it was full of practical items that I will use often! 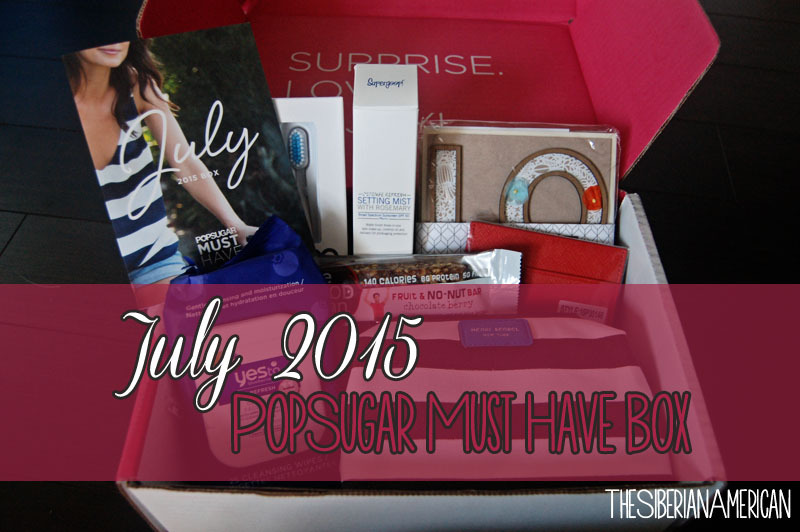 What do you think of the July 2015 PopSugar Must Have Box? What is your favorite item in the box? I just love the name Supergoop! Doesn't sound like a typical name for a setting spray! How do you or do you know what you'll receive in the box? I'm intrigued! I love the supergoop spray. It does smell a little funny but it works so well. I just bought my second bottle of it. oooh that makeup bag is so cute! and the travel toothbrush, what a good idea. i keep meaning to try the yes to blueberries wipes! I love it all! Great haul! This looks like such a great box! Love that makeup bag!! Totally loving that makeup bag! I'm a sucker for anything with stripes too! I love Supergoop products so be sure to let me know how you like that spray! !